Carroll Lutheran Village sits on 90 indisputably beautiful acres in Westminster in Carroll County. This retirement community has nearly 400 apartments and single family homes. It offers, as it says, a countrified setting within easy reach of big cities, "to give you the best of all worlds." Carroll Lutheran also has a nursing home. It is one of only two nursing home in Westminster (the very large GoldenLiving Westminster is the other) and one of 5 in Carroll County. Carroll Lutheran is a non-profit with 103 beds. As nursing home lawyers, the first thing we look at with a nursing home is its health inspections? Why? Because the first thing you want in a nursing home above everything going to take care of you and keep you safe. Carroll Lutheran Village's nursing home gets an abysmal 1-star rating for its health inspection. That's terrible. This rating is probably a little low because many of their "health" violations are not legitimate safety issues. But if you take a random walk through nursing homes that face lawsuits, you see a common thread: they do not do the little things. These little things add up when it comes to patient health and safety. Carroll Lutheran's most recent standard health inspection turned up 20 health deficiencies -- almost twice the Maryland state average (11) and nearly three times the U.S. average (7.1). That many deficiencies is a bright red flag. Yes, some of these were administrative in nature, not having to do directly with patient care. And although Carroll Lutheran had deficiencies in six of eight categories, for "mistreatment" it had zero. But it like we just said, if you miss the little things, you are going to miss the big things. And, not for nothing, it was cited failing to provide care for residents in a way that keeps or builds each resident's dignity and respect of individuality. That is a pretty scathing indictment for a nursing home or assisted living facility. On staffing, this facility did much better, with a 4 of 5 rating overall. This is common with non-profits who are mostly trying to do the right thing. Carroll Lutheran did better than the Maryland and national averages on total nurse time per resident per day, and was above average for time spent per resident by LPNs and LVNs (licensed practical nurses, licensed vocational nurses), certified nursing assistants, and physical therapists. This facility was slightly below Maryland and national averages on total RN time per resident; nonetheless, it got a 4-star rating on RN staffing. If this facility gets a red flag for health deficiencies, it might deserve a gold star for quality measures. Carroll Lutheran got 5 stars in this category. For short-stay residents, Carroll Lutheran had a mixed record. It scored distinctly better than state and national averages for helping these residents improve their functionality: 86.7 percent here, versus 64.8 percent statewide and 63.3 percent nationally. It was much better on the incidence of pressure ulcers: only 0.5 percent, versus the state and U.S. averages of 1.3 percent. This facility also had a higher-than-average rate of successful discharges into the community; and it was better than average on residents' self-reports of pain (there being fewer reports here), and in making less use of antipsychotic meds. On the down side, Carroll Lutheran was below average on rehospitalizations: about one-third of its former short-stay residents were rehospitalized, versus only about one-fifth on average, statewide and nationally. It was below average on how often former residents had to go to an emergency room; and much lower than average on vaccinating for pneumonia (reaching about half the residents; statewide and nationally the average is four out of five). Carroll Lutheran's record for long-stay residents also produced mixed results, albeit more positives than negatives. This facility was outstanding on preventing resident falls with injury: whereas the state average for resident falls is 2.9 percent, and the U.S. average 3.3 percent, this facility's percentage was zero. Carroll Lutheran was outstanding on the use of physical restraints: zero percent, versus 0.6 percent statewide and 0.8 percent nationally. It scored significantly better on the percentage of long-stay residents needing help with their daily activities: only 10.9 percent, versus 18.7 statewide and 15.4 percent nationally. It scored above average on preventing pressure ulcers. This is surprising because there and was better than average in having fewer long-stay residents report moderate to severe pain. However, Carroll Lutheran was more likely than the state and national averages to catheterize long-stay residents for extended periods. On the percentage of these residents losing excessive amount of weight, this facility was at almost twice the state and national averages. The rate of depressive symptoms among long-stay residents was a bit higher for this facility than the state and national averages. Carroll Lutheran was well below average on administering pneumonia vaccinations. In its last standard Medicare survey, in June, 2015, Carroll Lutheran scored a lower-than-average overall rating of 2 of 5 stars, a reflection of its abysmal 1-star rating for its health inspection. Yet in the same survey, this facility scored 4 stars on staffing (above average) and an outstanding 5 stars on quality measures. All and all, it is a very hard nursing home to figure out. Carroll Lutheran's next health inspection report may be very telling as to where this nursing home is heading. 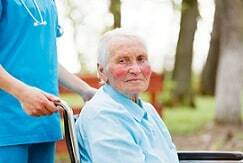 Do you have a possible assisted living nursing home lawsuit against this Carroll County nursing home or any other senior care facility? Call Miller & Zois today at 800-553-8082 or get a free no obligation case review. We can help you find the justice and compensation you deserve. There were 15 Facebook reviews of Carroll Lutheran at least count. Some are good and some are not so good. Review can be tough to interpret because you disgruntled people overrepresented and you also have clients that are coaxed into giving reviews. But they are still worth a read.